Travertine Landscape Tile for Patios, Walkways, and Walls - PetraSlate Tile & Stone is a wholesale supplier of quality flooring products from around the world. Visit us online to view our products Gallery. PetraSlate Tile & Stone is a Denver-based, world-class supplier of natural stone architectural materials for flooring, walls, fireplaces, exterior building claddings, and patio features. 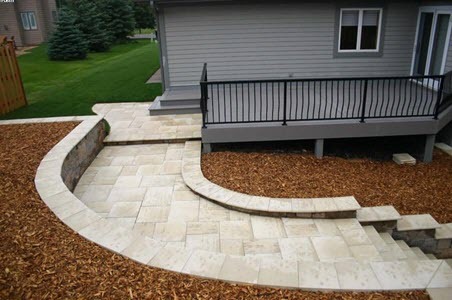 Genuine travertine tile used for exterior patios and walkways creates a striking and longlasting component for any outside entertainment and relaxation space. Travertine, a form of limestone known as calcium carbonate, is prevalent in many parts of the world including Italy, China, Turkey, and the United States. Top-quality travertine tile, distributed by PetraSlate Tile & Stone, is available in three categories: Field, Tumbled, and Versailles. Each type is offered in several forms, textures, and colors based upon the stone’s natural attributes and how the stone is cut. While Field and Versailles travertine is smoother for a more formal setting, Tumbled offerings are rougher textured to impart a more natural look. When building or redoing a patio with natural stone, selecting a travertine color and style that matches the home or building and the other surrounding features is essential. A beautiful patio is an exterior living and entertaining area that should transition naturally from the architectural aspects of the home. The right match can create a most beautiful and complementary element to the overall appearance of the house. Travertine stone tiles are available in an array of vibrant colors and patterns that include grays, silvers, rust shades, tans, and streaks of black or red. Experimenting with lighting will help to determine the overall impact of the travertine before the installation begins. To create an impressive and functional focal point in the patio design, an outdoor fireplace clad in travertine tiles can also be a useful and attractive addition. Moreover, adding a meandering travertine walkway and creating low adjoining walls and seating, plus vertical columns are excellent finishing touches for the project. PetraSlate is a leader in marketing natural stone products. Committed to the value, beauty, and practicality of real stone, PetraSlate offers tiles and veneers using natural travertine, limestone, and marble in a wide range of colors, styles, and textures. For more information about PetraSlate’s extensive product offerings, visit their website at https://petraslate.com/contact-us/ and complete the Contact Us information sheet. One of the PetraSlate professionals will contact you to answer any questions. Or, phone PetraSlate Tile & Stone at +1-303-280-9595.